The Global Nephro Training Center (GNTC) is the premiere human resource development hub of the Nephro Group, The Pioneer in Professional Out-­Patient Dialysis since 1995. 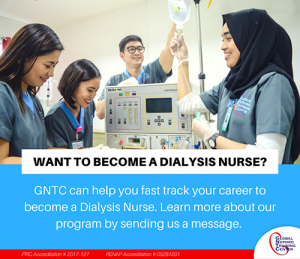 In keeping with its goal to provide expert yet affordable dialysis treatment available to patients facing renal dysfunction challenges throughout the Philippines, The Global Nephro Training Center (GNTC) was created to ensure that the exceptional preparation for the proficiencies required of all its medical services personnel is continuously provided and upgraded while the Nephro Group continues to expand and extend its services nationwide. Certified nephrology nurses are skilled medical professionals who apply their specialized knowledge of kidney disease and related systems to the care of kidney disease patients and at-­risk patients in a variety of medical settings. Working to both prevent disease and provide continuing support to patients and their families, nephrology nurses provide care through all points of kidney disease progression. Nephrology nursing grants the opportunity to provide care to diverse patient populations in many kinds of in­patient and out­patient settings. According to ANNA, advanced practice nephrology nurses provide optimum care when they are trained or gain experience in a sub­specialty relating to nephrology, with a focus on a particular patient population. Nephrology is a multifaceted specialty that did not exist before 1950. Its evolution and development, however, were rapid. In 1971, a group of young nephrologists fresh from their specialty training abroad founded a society that was to spearhead the development of renal care throughout the Philippines, the Philippine Society of Nephrology (PSN). Since then, the role of the nephrology nurse has greatly expanded and practice boundaries broadened. Nephrology nursing involves both preventing disease and assessing the health needs of patients and families. Care spans the life cycle and involves patients who are experiencing the real or threatened impact of acute or chronic kidney disease; therefore nephrology nurses must be well­-educated, highly skilled, and motivated. These nurses also deal with every organ system in the body, calling for a holistic approach to patient care that is both challenging and rewarding. Care may be extremely complex: patients may have numerous comorbid conditions including, but not limited to, cardiovascular disease, diabetes, hypertension, infectious disease, bone disease, or psychiatric conditions. In addition, many face psychosocial issues. The nurse’s role is to help patients manage their lives ­ succeed at school or work, socialize, maintain relationships, or enjoy hobbies ­ while effectively dealing with their health issues. It is important to note that not all patients with kidney disease require dialysis and/or transplant; the majority of the diseases that affect the kidneys are treatable and potentially able to be arrested or even cured. Some patients may elect conservative management and palliative care. In these cases, one of the nephrology nurse’s primary roles is to educate patients about their diseases, prognoses, and treatments. Nephrology nurses practice in dialysis clinics, hospitals, physician practices, transplant programs, and many other inpatient and outpatient settings. They work in primary, secondary, and tertiary care facilities as well as in patients’ homes – wherever individuals experiencing or at risk for kidney disease receive health care. In inpatient settings, patients are often critically ill and care is fast­-paced and challenging. In outpatient settings, the nephrology nurse is an integral member of a multidisciplinary team that cares for patients with complex needs. The nurse in this setting functions as advocate, educator, consultant, care coordinator, and direct caregiver and oversees long-term care of chronically ill patients. As such, the nephrology nurse can have a positive impact on the quality of patients’ lives. Develop globally competent graduates able to render compassionate quality care thereby assuring excellent patient care outcomes. To be a globally-recognized and preferred training institution in the renal and health-allied industries. We commit to provide excellent training to nurses and service to all our stakeholders and conduct ourselves in a professional manner all the time. We ensure sufficiency in knowledge and skills that will enable each employee to act in various situations and each nursing trainee to be equipped as a Hemodialysis Nurse Specialist. We recognize the value and contributions of each member of the GNTC team and work in synergy with the members of the Nephro Group of Companies in the attainment of our vision, mission and goals. We maintain a high standard of professional ethics, behavior and work activities while carrying out our profession as an employee and the way we do business. We continuously innovate in response to the varying and changing needs of our stakeholders. We practice honesty, transparency and moral uprightness in all our actions. We uphold the worth and dignity of individuals and consistently demonstrate our sensitivity to the well-being of others and our responsiveness to their needs.